It has been over a month since I posted an update on the progress of Audun Tholfsen and Timo Palo, the two Norwegian explorers who were dropped off at the North Pole back in April and have been making their way south ever since. The boys have had their struggles over the past weeks, but they continue to make good progress and are slowly, but surely closing in on the finish line at last. While on their journey, Audun and Timo have traveled by ski and kayak as they make their way towards Longyearbyen, on the island of Svalbard. The entire excursion will cover approximately 1400km (870 miles) once it it completed and will mark the longest and most challenging North Polar expedition of the year by far. As of yesterday the duo were at about 82º30' north latitude, which would put them squarely in the Arctic Ocean. But since the area is still mostly frozen, they continue to use a combinations of skiing and paddling to make progress. The two explorers have been making periodic updates to their blog in which they share the experiences of their travels. Those experiences have included nasty storms that have lasted for several days, dealing with broken equipment, polar bears, difficult terrain and more. All of those things have made the journey a challenging one, but they are still on track to finish sometime late this month, provided they don't encounter more unexpected challenges. 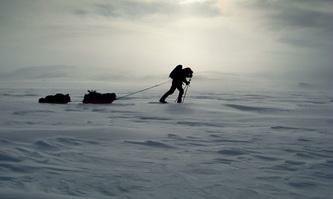 Its great to see that one of the North Pole expeditions is doing well and continuing forward. It's beginning to look like more expeditions will be starting at 90ºN in the future instead of ending there.